3054 - Photo: Antony Guppy. 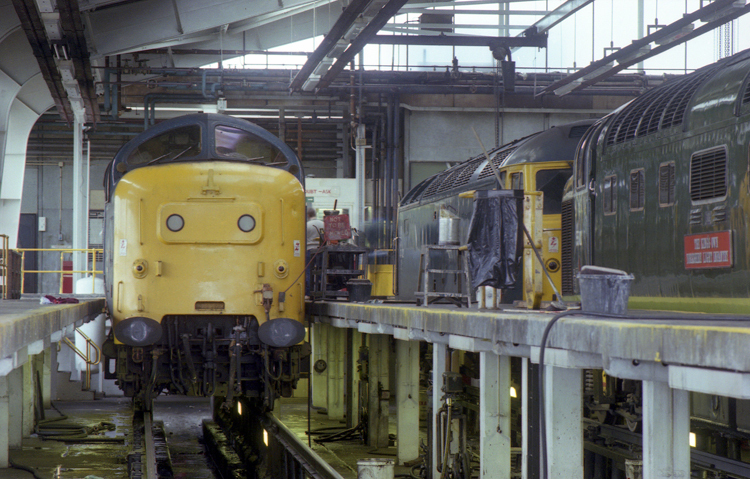 55021 (D9021) "ARGYLL & SUTHERLAND HIGHLANDER" undergoes routine maintenance at Finsbury Park on the 22nd November 1981 as 55002 (D9002) "THE KING'S OWN YORKSHIRE LIGHT INFANTRY" looks on. 55021 would later leave to work the overnight 1S77 23:55 King's Cross - Edinburgh, "The Night Scotsman" service. 22/11/81 - 1E35 20:45 Edinburgh - King's Cross. Swansong in Camera: Page 7 (from Edin 21/11 at KX 22/11).